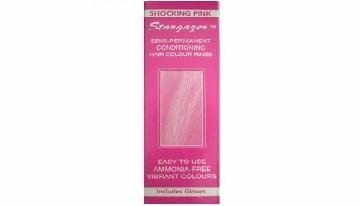 Shocking Pink Colour Semi-Permanent Hair Colour A semi-permanent hair colour with conditioner for direct application to the hair. Free of ammonia or peroxide stargazer hair colour allows you to achieve a wide range of vibrant translucent colours. Stargazer hair colour can be applied to natural, dyed or bleached hair (please note that stargazer hair colour will not cover white or grey hair). All 26 of the stargazer hair colours can be mixed together to produce an ever wider array of colours. The inside of the hair colour box contains instructions and caution note in eight different languages. A pair of disposable gloves are included for use with the hair dye.